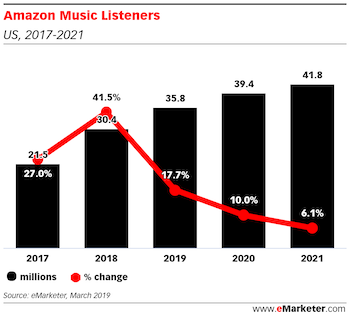 eMarketer predicted that Amazon Music be the fastest-growing service for audio streaming in 2019 and through 2023. According to its latest statistics, Amazon Music will reach 35 million monthly U.S. listeners this year thanks to a growth rate of 17.7%. This isn’t the first report to project big numbers for Amazon’s streaming service. It delivered strong awareness in the 2019 Infinite Dial report, and is especially popular among smart speaker owners. eMarketer also noted that although Amazon Music is not an ad-supported platform, Amazon is still expected to exceed $11 billion in ad revenue this year. Access to Amazon Music is through the company’s Prime membership program, and although the audio streaming service is not the primary benefit for many participants, more than half of all U.S. households are projected to be members this year. That gives Amazon a large potential audience to reach.